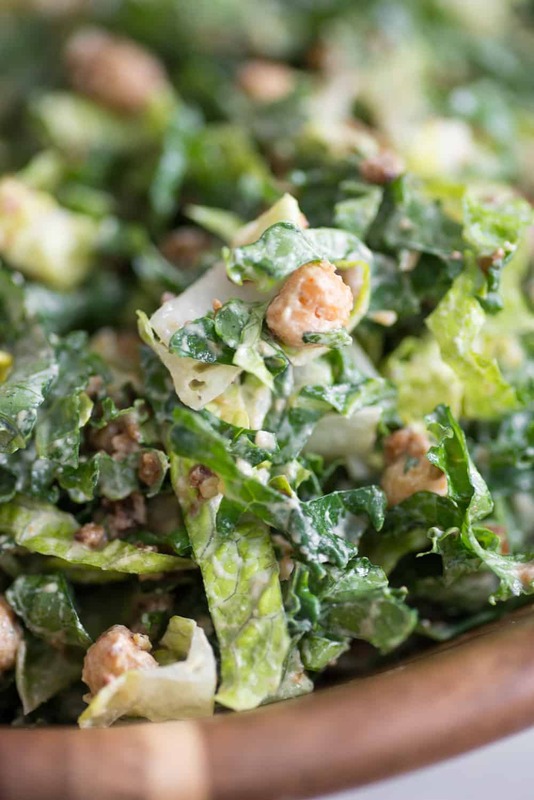 Are you ready for the ultimate protein-packed vegan caesar salad? 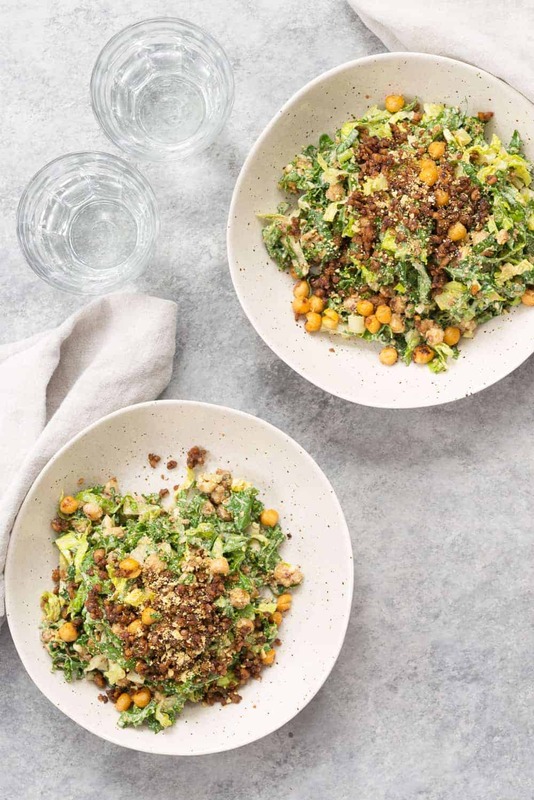 The one that’s covered in a creamy, dairy-free caesar dressing and topped with crispy tempeh bacon bits, crispy chickpea croutons and homemade vegan parmesan cheese. This really is one of the best salads, and something I make all the time when I’m hosting company. I get together with my mom friends every week or so for a lunch play-date. It’s a time when our kids can get together and more importantly, when we moms can catch up and eat! I prefer to host these events because, well, I just love hosting. Even though our home is not made for large get togethers, it’s so fun to make a new recipe for my friends with the added bonus of not having to pack up Vander and drive anywhere. Well, I made this vegan caesar salad for everyone last week and it was a HUGE hit. Most people know that I’m likely serving vegan/vegetarian food to them, but they all couldn’t believe that the dressing was completely dairy-free. This one has lots of moving parts, but they can mostly all be made ahead of time for easy assemble when you are ready. 1. The vegan caesar dressing! This dressing recipe is adapted from one of my favorite cookbooks, Isa Does It. Her dressing recipe is a little more garlic heavy than mine, but I didn’t want it to overpower the other parts. Mix everything together in a blender, this dressing will keep for ~5 days in the fridge. 2. Tempeh bacon crumbles! Familiar readers will know this recipe, as it’s one that I use ALL the time. I love it in pasta and I really love it in this recipe. I prefer to cube the tempeh, but you can also crumble it with a grater. Just depends on the texture you prefer! This can also be made ahead of time, and then reheat (or don’t!) in the fridge. 3. Crispy chickpeas! I love adding these for a extra protein-crunch, but I don’t think they keep as well after they are made. Therefore, you can leave them out if you want to make this recipe for quick assemble during the week. 4. Mix of greens. This recipe will taste great with just about any green, but I like the combo of lettuce and shredded kale. I think the kale is a little more hearty and stands up to the dressing very well. If you don’t think you like kale, then try this method. Wash and dry, then remove the inner rib. Stack the leaves, and roll very tightly like a cigar. Then, starting from one end, slice the kale into thin ribbons. The Ultimate Protein Packed Vegan Caesar Salad! This is the salad to answer “where do you get your protein from! ?” Well, how about a salad!? 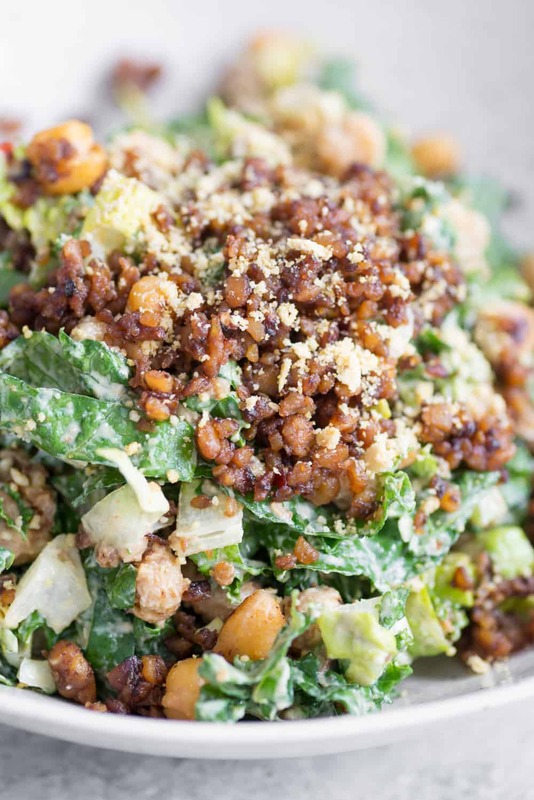 A vegan caesar salad with crispy tempeh bacon bits, crispy garlic chickpeas, vegan nut parmesan and the most amazing, briny vegan caesar dressing. 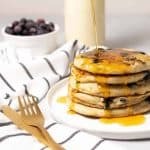 19-28g of protein per serving! Make the tempeh: Heat the olive oil in a medium skillet over medium heat. Add the tempeh and cook for 5-6 minutes, until tempeh is golden brown and lightly crispy. Whisk together the soy sauce, maple syrup, balsamic, cumin and red pepper flakes, then add to the skillet. Cook, until tempeh becomes crispy and browned, another ~5 minutes. Stir often so the tempeh doesn’t burn. Make the chickpeas: Remove the tempeh from the skillet, set aside, and wipe out the skillet. Heat the skillet back over medium heat. 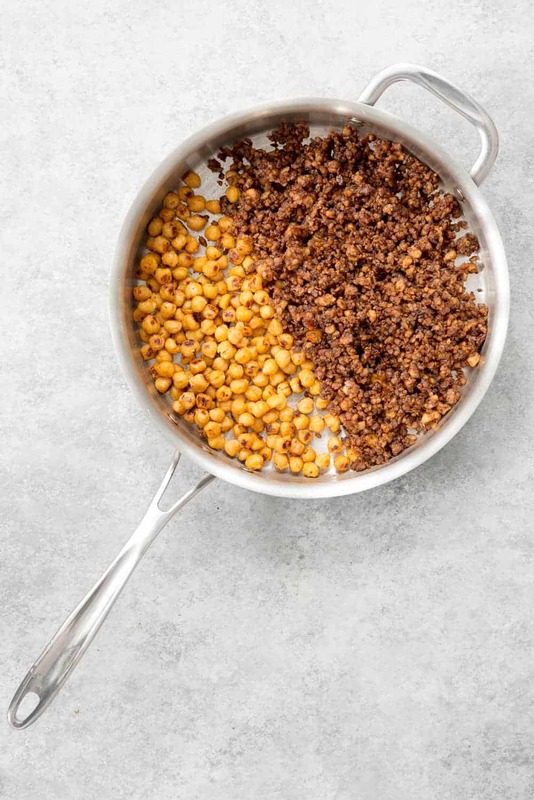 Toss the chickpeas with the oil, salt, garlic and cayenne pepper and add to the skillet. Cook, tossing often, until chickpeas are crispy, about 8-10 minutes. 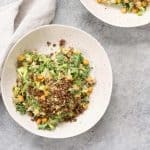 Make the dressing: Place everything into a blender and puree until very creamy and cashews are no longer grainy, scraping down the sides as needed. If the dressing becomes too thick, then add in a little more water. Taste for seasoning, adding more salt/pepper as needed. Assemble the salad! 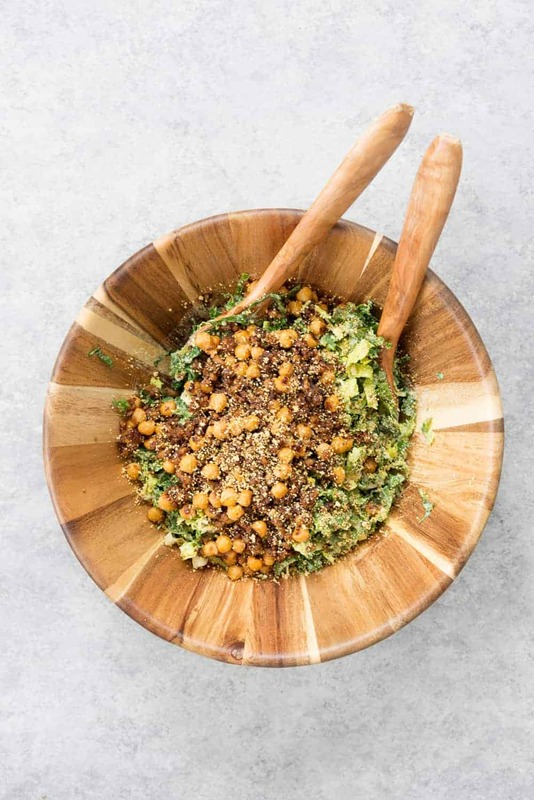 Place the kale, lettuce, tempeh, chickpeas, parmesan in a large bowl. Add in 1/2 of the dressing and toss to combine until well coated. Continue to add more dressing, as desired. Enjoy! So, so good. No time to soak cashews? No problem. Use this hack: place raw cashews in a container and cover with boiling water. Let sit for 30 minutes, then drain. He doesn’t usually like chickpeas on salad, but said he really enjoyed them here. Five stars! The tempeh will be staple in our house to add to salads and grain bowls too! So delish! Yes, we love the bacon as well! You don’t have to steam it first. I use a pretty mild tempeh (usually one by lightlife or trader joe’s). However, if you find that the tempeh is bitter at all -then you’ll want to steam it first next time. 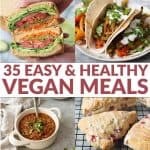 Yes, trying to add in more vegan recipes! Thank you Alex ! You caught me before I got started I will go right into recipe then. The only brand I can find up here is 55 miles away and it’s the 5 grain by Yves. (West Soy). I think that’s why it was reduced to tiny crumbles when I made your sausage recipe. It was still good though. Thanks!